Our winery actually produces Petite Sirah as well, so I get the question a lot “What is the difference between Petite Sirah and Syrah?” All I know is that they are two separate varietals, but here is the real skinny on the subject. As it turns out , Petite Sirah’s mother plant IS IN FACT Syrah. So to sum it up briefly Petite Sirahs “baby mama” is Syrah. Petite Sirah originated from the Rhone in France and was created when Peloursin “the baby daddy” and Syrah were crossed. So there you have it! …we have some baby mama drama to add to our Petite Sirah Vs Syrah battle. The 2006 Guffy Syrah has aromatics of ripe blueberries, cherries and raspberries. It has a little bit of cola and eucalyptus. The Guffy Syrah comes from Carneros, Napa Valley. There are a ton of eucalyptus trees in the appellation. The sap that falls from the eucalyptus is Puuuhngent and undoubtedly plays a role in the wines for some Carneros producers. However tonight I am the only one who smells eucalyptus so I might just be crazy. Back to Guffy, this wine is fantastic for a “RAB” I am pleasantly surprised. It is full bodied, very ripe and has a long finish that leaves vanilla, baking spices and a little bit of cocoa lingering. If I were a fancy wine writer I would give this wine 90 points. But I am not…so whatever. 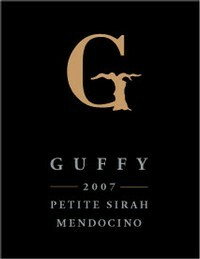 The 2006 Guffy Petite Sirah is totally outrageous right out of the gate. I feel like I am getting smacked around by its big tannins and it’s and instant love hate relationship. It is super ripe, jammy and has this crazy concentrated blackberry fruit flavor. The finish has a lot of mocha. I love that….but I feel like it is not as balanced as the syrah. The syrah was a little more sophisticated to me. It had more layers. This Petite Sirah is wonderful it is just not as well rounded as the Syrah. HOWEVER- many people are into the jam in the jar thangg and I can’t hate…it is a great wine. I would rate this wine 88 points. Ladies and Gents, if I were the line judge on this one , it would be a tight match but I do believe the Guffy Napa Valley Petite Sirah would take the cup. Do it! and then let us know which varietal wins your “battle of the bands”! Enough for today my friends there is too much good football on! Let’s go Vikings… Love ya Brett. certainly like your web-site however you need to test the spelling on several of your posts. A number of them are rife with spelling problems and I find it very bothersome to inform the truth then again I'll certainly come again again.